Kenny Omega promotes his upcoming documentary and discusses his free agency, final thoughts on the Royal Rumble, Halftime Heat returns on Sunday, Will Ospreay's injury, and more. **We have our big Royal Rumble POST Show on the site with Wai Ting and I running down the card from Phoenix with our analysis of all the matches, the Royal Rumble winners and execution of each Rumble, the crowd’s effect on the Daniel Bryan vs. AJ Styles match, what worked and didn’t along with the directions coming out of the show as they start the real build towards WrestleMania. Plus, we take your phone calls and feedback at the end of the show. We will also be announcing the winners of the POST Wrestling Royal Rumble Pool. **Wai Ting and I are back tonight with Rewind-A-Raw for the WWE’s third straight night in Phoenix with the fallout from the Royal Rumble. **Kenny Omega was a guest on TSN 1290 in Winnipeg with Andrew Patterson on Monday to promote his documentary that will air in March on TSN in Canada. Omega said he didn’t have a lot of free time and was unsure if he would enjoy the experience of having a camera crew following him. He was impressed with the producers’ research on his career and wanting to present his story. 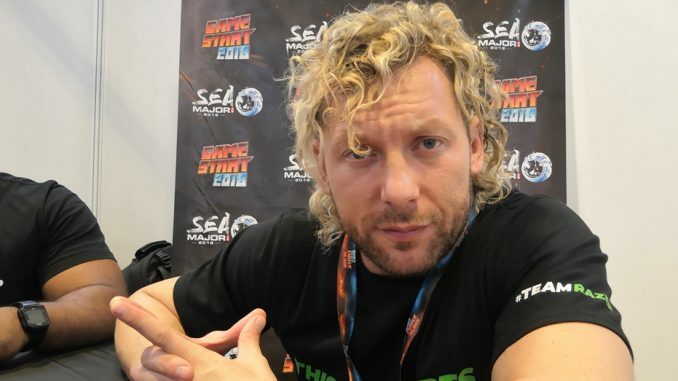 Omega discussed his exit from Deep South, helping to grow DDT, moving to New Japan Pro Wrestling full time and helping to expand the promotion worldwide. He referred to himself in the interview as a “free agent” and is “seeking other opportunities”. The documentary will mainly focus on his last two years with New Japan Pro Wrestling leading up to free agency. Omega admitted he has gone off the grid lately because he needed time off. He is also working on non-wrestling projects and is using this time to step away and not focus on when he is going to be wrestling again. He would only state there will be developments soon. **Tonight’s episode of Raw takes place from the Talking Stick Resort Arena with their third of four consecutive nights in Phoenix, Arizona. They have not announced anything yet for the show. The Elimination Chamber is the next major show on the calendar in three weeks on February 17th in Houston. **The Royal Rumble card considered a good show, although show fatigue becomes a common complaint after these cards regardless of the quality level. The company is concentrated on network hours of consumption so there is a theory to why these shows are longer and whether they believe it’s a turnoff to their audience or just something people will complain about while continuing to watch. The Rumble matches were a mixed bag with the women’s match benefiting from a great finish with the most popular performer on the show winning. It was hurt by the length of the match and many women out of their comfort zone carrying such a long match. I felt the women’s Rumble was badly struggling until Charlotte Flair entered and it didn’t find its groove until the closing 10-15 minutes. The men’s match held my interest from beginning to end but didn’t have the same dynamic as Becky Lynch and Charlotte Flair produced in their final moments. I liked Seth Rollins winning and making him the clear challenger coming out of this show rather than a desire to surprise the people with a red herring that won’t be paid off. Neither match relied on surprises from the past except for Jeff Jarrett in his 1994 gimmick and coming off ridiculous but entertaining for the interaction with Elias. Hornswoggle was the only other name from the past and used strictly for comedy, which was fine. The other surprises were NXT, NXT UK and Performance Center talent, who were largely each given a special moment and not simple cannon fodder for the main roster performers. The non-Rumble matches ranged in quality with the brunt of criticism reserved for Daniel Bryan and AJ Styles’ match that clocked in at close to 25 minutes. It was too long a match in front of a crowd that was spent after the women’s Rumble and knowing they had two titles matches and a men’s Rumble still to go. It was one thing if this was designed as a culmination to the feud, but it felt like an extension and a way to re-introduce Erick Rowan. I thought this match could have been cut down a lot and suffered for its length and placement with a lackluster ending. **During Sunday’s Royal Rumble broadcast, it was announced that the WWE is bringing back “Halftime Heat” this Sunday. The brawl at the end of TakeOver on Saturday was done to set up a six-man tag for the special with Tommaso Ciampa, Johnny Gargano, and Adam Cole vs. Velveteen Dream, Ricochet and Aleister Black with Shawn Michaels on commentary. The match will be broadcast live from the WWE’s Performance Center in Orlando and stream on the WWE Network, WWE.com, the WWE app, Facebook, Twitter, and YouTube during halftime of the Super Bowl. The company attempted this experiment in 1999 with an Empty Arena match between Mankind and The Rock that was taped in advance with Mankind defeated The Rock for the WWF title. The difference is that special aired on the USA Network and did an enormous audience with a 6.59 rating according to the Wrestling Observer Newsletter from that week. **Will Ospreay suffered a broken toe in a recent match from a simple arm drag he took, which is amazing considering who we are talking about. Ospreay stated regardless of the injury, he will be going ahead with his match against Pac on February 15th for Revolution Pro’s next event at York Hall in London. There has been a lot of speculation about Lars recently. It’s true, he went missing several weeks ago and I was just able to contact him this morning. Lars wants everyone to know he is in a good place, and is sorry to everyone he’s disappointed. **Jacob Fatu has been added to MLW’s Superfight card this Saturday in Philadelphia at the 2300 Arena. **The WWE stock closed at $81.84 on Monday. **Cris “Cyborg” Justino posted a photo from outside of the WWE’s Performance Center on Monday. **LFA 60 will take place on Friday, February 15th from Clive, Iowa on AXS TV at 10 pm Eastern. The card will feature Julius Anglickas fighting Clayton York for the promotion’s light heavyweight title.